McIntoshes Rocks are 2km upstream from the Waimakariri River mouth. It is a great place to go to while away a few hours with a good chance of catching a salmon for dinner or the smoker. Indeed if you are new to salmon fishing this is a great place to go to start out. Most of the anglers there are friendly and helpful towards beginners. Most are willing to pass on a few salmon fishing tips to a beginner. Even if you don’t catch a salmon yourself there is a good chance you will see one landed close up. 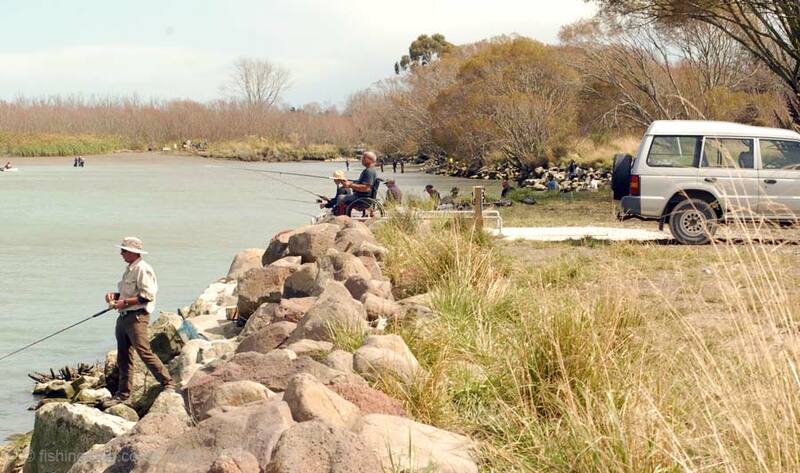 McIntoshes Rocks is an excellent spot for Waimakariri River salmon fishing before or after work! 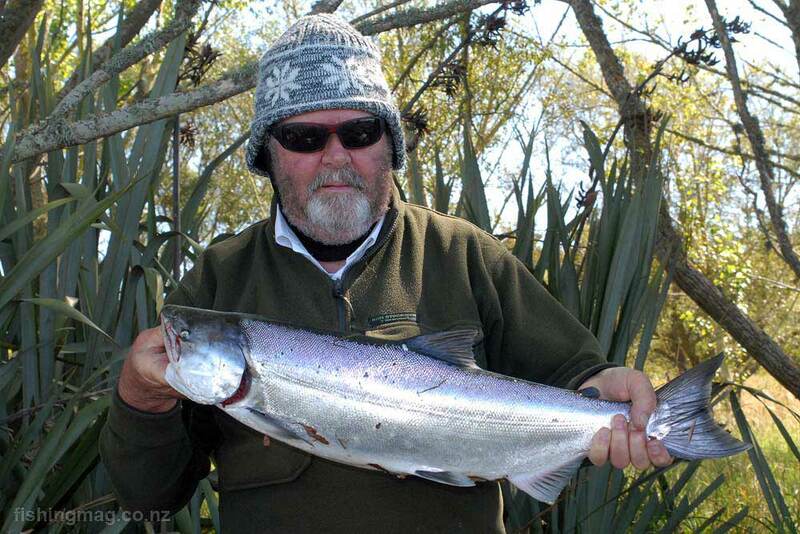 Winning salmon from Waimakariri River Salmon Fishing Contest caught at McIntosh’s Rocks. The car park at McIntosh’s Rocks near the mouth of the Waimakariri River in the late evening sun. This is one of the few places that you can’t drive right up to the river. Anglers must park and walk a hundred metres or so to the water. The number of cars in the car park is a surprisingly accurate gauge of how good the salmon fishing is. In the picture, there are about twenty cars. If there was a big run of salmon being caught this could rise to 150 cars or more! When salmon are being caught here news travels fast and the car park fills up quickly. Strange but true! This fishing spot also has good fishing for trout and yellow-eyed mullet. My pick of salmon tackle for fishing at McIntoshes would include a 2.13m (seven foot) graphite rod and baitcaster reel. There are two basic types of rod available. One is for use with a freespool reel which is fished on top of the rod. It has at least eight smaller line guides and often a trigger grip under the rod. This is my preference. The second type of rod is designed for use with a fixed spool reel (eggbeater), which is fished under the rod. Usually, there are fewer line guides; mostly five or six. 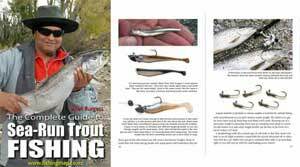 The first line guide closest to the reel is always bigger with this type of rod because the line comes off the reel in large coils that are progressively dampened as the line travels up through the guides towards the tip. There are many rod and reel combinations available at tackle stores. Most novice anglers start out with a fixed spool reel or eggbeater and later they progress to a free-spool also called a baitcaster reel. The baitcaster takes a bit more time to learn to operate correctly than an eggbeater. With an eggbeater, they is no chance of you getting a dreaded tangle (birds nest) when casting. The ratio of baitcasters to eggbeaters among salmon anglers would be around 20:1. 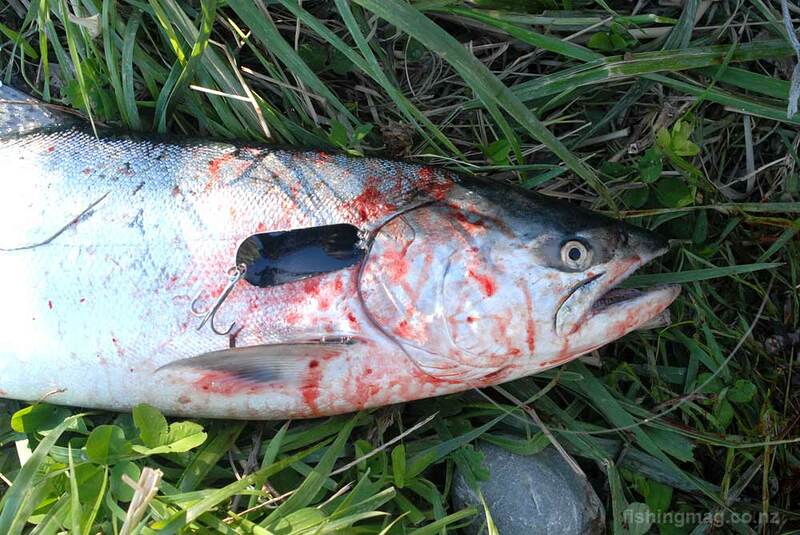 The Zed spinner is the most popular lure used for salmon fishing at McIntosh’s Hole. Perhaps 99 percent of the salmon taken are caught on a silver, white or yellow Zed spinner. coming off the spool faster than the lure is taking it away. I still use my old Daiwa Regal 2500 for just this reason when the wind is blowing hard towards me when I’m casting. You can get some excellent eggbeater reels these days, which incorporate multiple ball bearings in their construction, reasonably cheap compared to 20 years ago. Winding the handle on these modern eggbeaters you’ll find them very smooth indeed. Gone is the unbalanced wobble you used to get! The way to avoid birds nests with a baitcaster is to tighten the adjusting knob on the end of the reel which causes more friction on the spool. 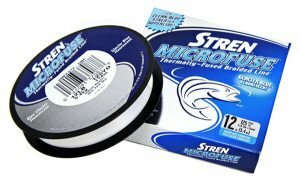 This reduces casting distance but greatly reduces tangles when casting. As you get better at using the free-spool you can begin to loosen the knob back a little at a time. 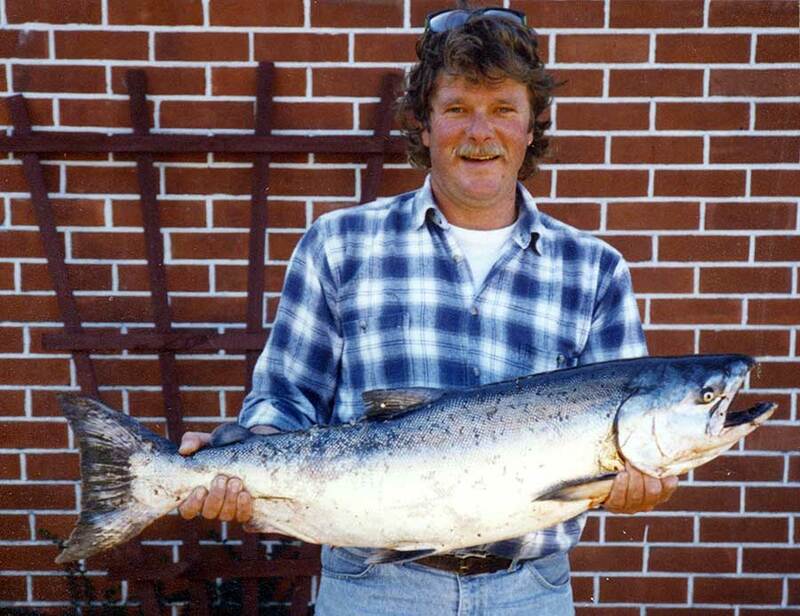 Chinook salmon caught at McIntosh’s, Waimakariri River, at the end of March 2007. It weighed 16 lbs. This fish was in excellent condition. Photograph courtesy of Greg Martin. A free-spool is better because the line lasts longer, are lighter, casting accuracy is greater, and baitcasters generally last much longer in use than an eggbeater. For your first baitcaster I would get an Abu 6500. You can’t go wrong with one of these. They last forever. Should you decide to buy a flasher baitcaster later on like the excellent Shimano Calcutta 400 your Abu 6500 will be a good spare to have in your bag should you get a breakdown or hopeless “bird’s nest” on your new reel. For river fishing, such as at McIntosh’s Rocks, you want a reel that holds at least 200 metres of 9.1 kg (20 lb) monofilament line. It is fair to say that braided line has almost completely replaced monofilament for salmon angling. Braid has the benefit of having practically no stretch and is much stronger for the same diameter. This means you can pack on a much longer length of line for the same size reel spool. It cuts through the water very well – far better than mono – and sinks to fishing depth much faster and casts further. The other big advantage of braid is that you can feel every scrape and touch on the bottom. You can also feel the slightest touch of a fish on your line that would be impossible to detect through stretchy monofilament. Braid has become much cheaper in the last few years. I strongly recommend you switch to braid from monofilament if you haven’t done so already. You will also need at least ten silver Zed spinners. The most popular weights are 22-28g. On some fishing days you can lose quite a few; other days you don’t lose any. Always carry plenty just in case it turns out to be one of those bad days. When the river is a bit murky or discoloured the salmon seem better able to spot white Zed spinners. I have had a great deal of success with these even when the river is clear. More here on zed spinners too. 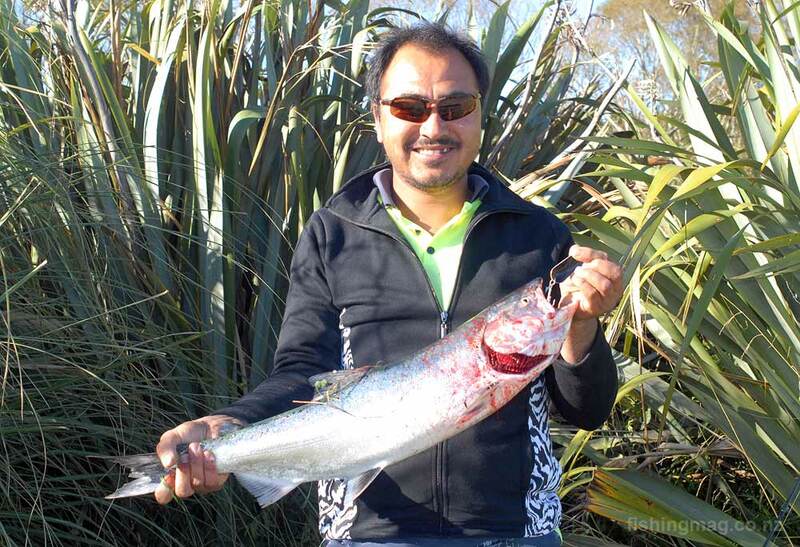 This salmon has just been landed at Macintoshes Hole on the Waimakariri River. Nearly all the salmon taken here are caught on zed spinners. Note also the Abu 6500 baitcasting reel. These reels have sold in huge numbers over the years and are very good value for money. The only other thing you need for salmon fishing at McIntoshes Rocks is a salmon landing net. You need a big salmon sized net. It is next to impossible to get a salmon out of the water along the rocks without a net. Anglers used to use a gaff (strong stick with a big hook at the end) but you don’t see this much anymore. Sometimes your salmon will be foul hooked and you will have to release it. A net will allow you to do so without harming the fish. If you don’t have a net someone else probably will. Someone with a net is sure to assist you to land your fish. Never attempt to help someone land their salmon unless they give you the go-ahead first. If it is lost you’ll get the blame. 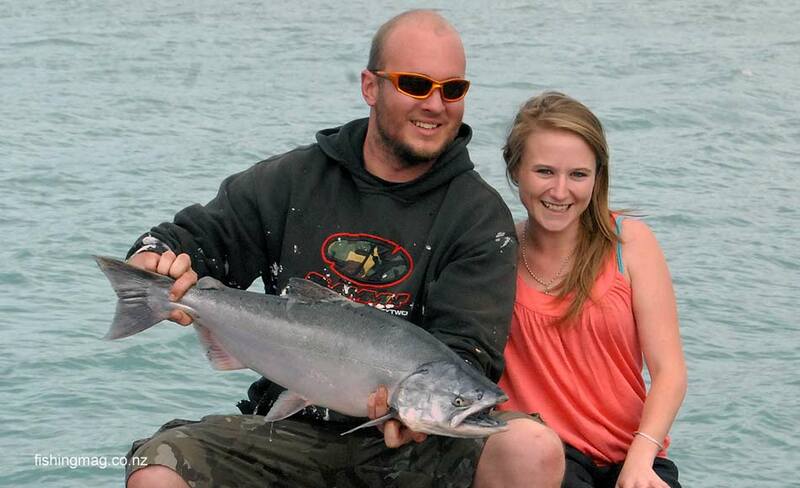 Generally, though salmon anglers at McIntoshes get on well together and will help you net your fish. 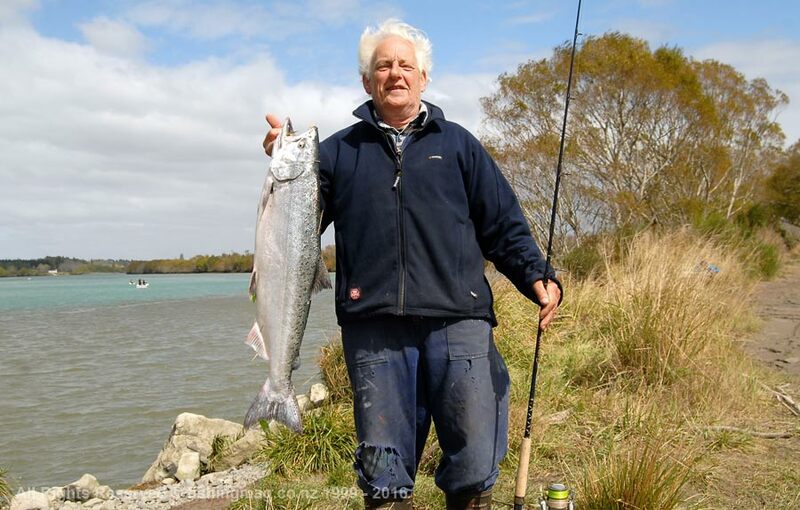 See a 17 pound Waimakariri River salmon caught at McIntoshes Rocks. Here is another big fish lifted from the rocks in a salmon landing net before being released. If you don’t take along your own net you risk catching a big fish on a day when there are only a few anglers present and no one has a net! A McIntoshes Hole you need a net to land your fish. One of the biggest mistakes I see anglers make at McIntoshes Rocks is that they cast out and then start winding straight away before their Zeddie has had time to sink down near the bottom. You have to cast upstream at about 45 degrees then count about ten seconds before you start winding. Winding speed is also critical. If you wind too fast your Zed spinner will plane to the surface and you won’t catch any fish. Unfortunately watching the bloke fishing next to you and copying him isn’t always a good idea as he could be winding too fast as well. 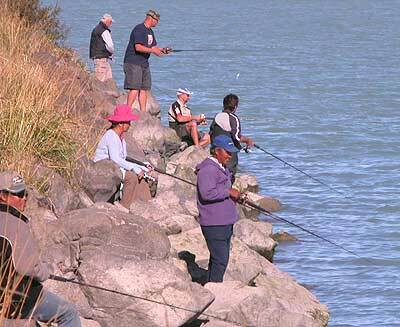 Salmon anglers after a fish at McIntosh’ss Rocks on the lower Waimakariri River 3 February 2006. The salmon angling has been slow so far this season perhaps as a result of lower than usual river flows. There are salmon porpoising but few are being caught. There doesn’t seem to be as many people fishing for salmon this season. A good tactic for the beginner is to ask the other anglers; who catches the most fish? Then watch him for a few minutes to see how long he waits before winding and see how slowly he is turning his reel handle. You are certain to be surprised at just how slowly some of the top anglers are retrieving their lures at McIntoshes Rocks. Keep in mind that the water in front of the white post is 7 to 10 metres deep. When the tide is running out the river flow increases in speed. This also causes your lure to rise to the surface faster. Sometimes when you are overly keen and you can see others landing salmon you get excited and start winding faster and faster! The best time to fish is the top two hours of the tide particularly when it starts to run out. I have caught salmon at McIntoshes at all different stages of the tide so I wouldn’t worry too much if the tide is all wrong. The salmon don’t care either way. Many anglers at McIntoshes Rocks will tell you that if you can see salmon porpoising on the surface you are unlikely to catch one. I think this is largely correct. I have fished there some nights when salmon have been breaking the surface all over the place and nobody is catching them. Mind you some anglers are much better at spotting fish than others. This salmon jumped well clear of the water six times. Experienced anglers knew immediately that it would likely be foul-hooked! Finally fishing at McIntoshes Rocks isn’t for everyone. When a boatie decides to park 20 metres straight in front of a line of anglers fishing from the rocks tempers get frayed. 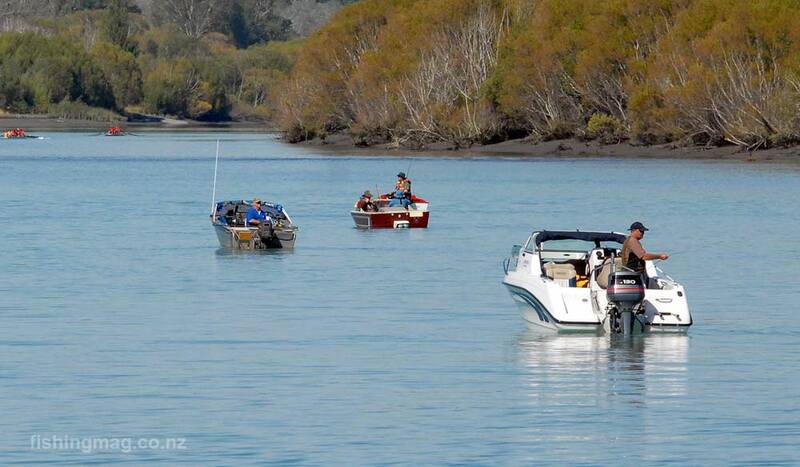 If you are a boatie fishing here use your head and anchor on the other side of the river. If you like fishing in the close company of others and having a chat about fishing or anything else it could be just the place. It is great to arrive after work and quickly discover exactly how many fish have been caught there that day and when they were landed. Sometimes it can get very crowded with salmon anglers fishing from boats anchored in the river. I think I once counted 27 boats anchored along this stretch. You have to make allowances for this. They is often something interesting going on: a boat passing too quickly, someone landing a fish, kayakers paddling past, fish swirling, mullet eating algae from the rocks, and just maybe you might catch a salmon as well too! This short video was taken early on Saturday morning 5th March 2016 at McIntosh’s hole on the lower reaches of the Waimakariri River. Tony who was fishing off the newly built wheelchair ramp and Kevin who was fishing off the rocks further upstream both captured their first salmon for the season. (Well done). Video made by and courtesy of Kevin Belcher. 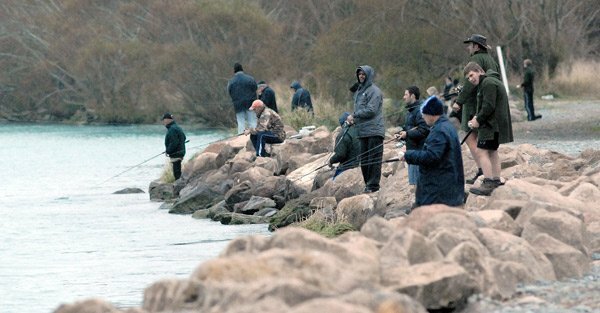 Anglers line the banks at McIntosh’s Rocks 2km from the Waimakariri River mouth also hoping to hook an elusive salmon during the 2010 New Brighton Sports Salmon Fishing Competition. In the top right of the picture, you can just make out the line of anglers on the north side of the river mouth. McIntosh’s is a popular place to fish when the salmon are running. McIntoshes Hole 2kms from the mouth of the Waimakariri River from a height of 300 feet. 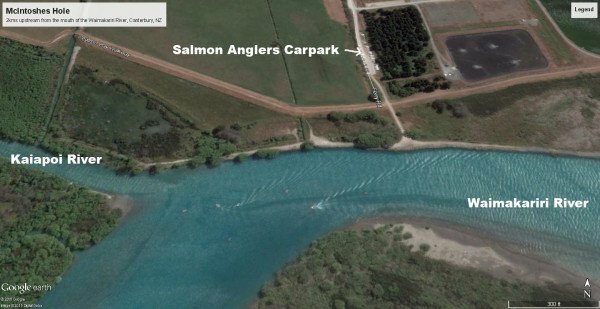 You can see there are a lot of salmon anglers cars in the carpark at the top of the photograph – a sure sign the salmon are running. You can also make out some of the salmon anglers’ boats. Map courtesy of Google Earth, TerraMetrics, and DigitalGlobe. Click image to enlarge. 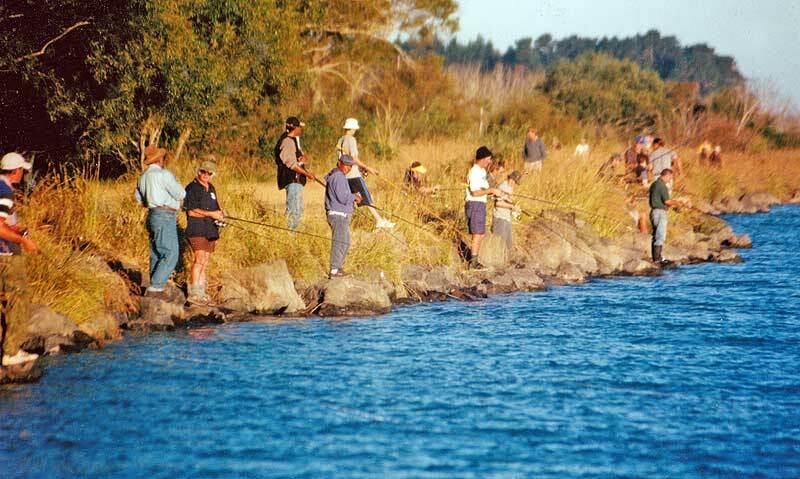 McIntoshes Rocks is one of the few places Canterbury salmon anglers are advised to use a net to land their fish when fishing from shore. One of these nets is also excellent to use when boat fishing as well. 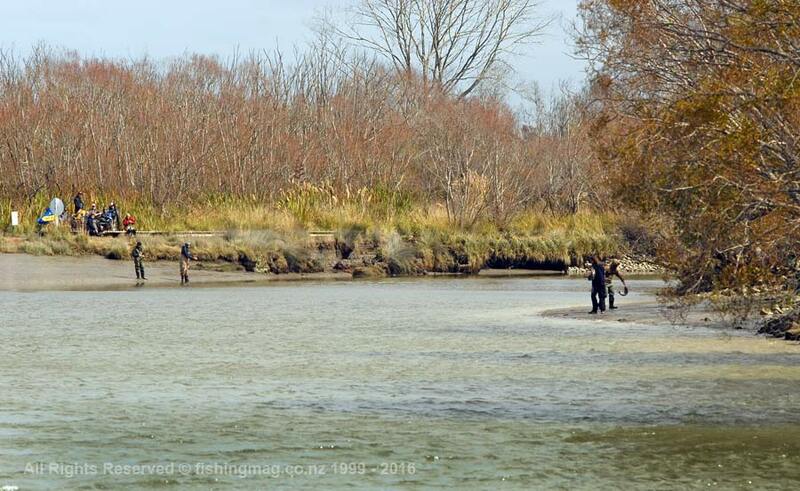 Salmon anglers fishing at Macintoshes Rocks, near the mouth of the Waimakariri River, need a net to land their fish. This is one of the few places in Canterbury where a net is essential for landing your salmon. 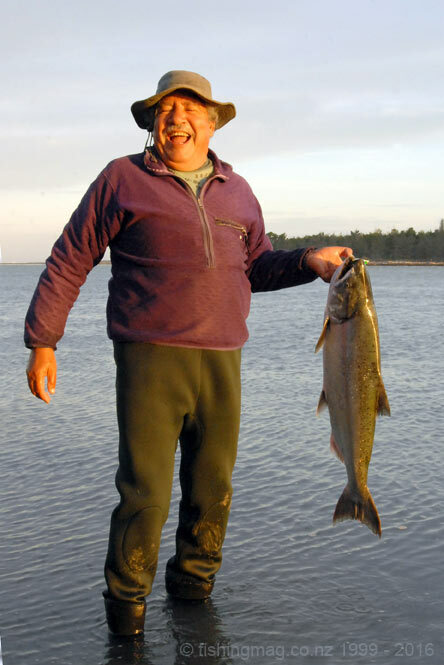 A 30-pound angry salmon cannot readily be tailed from the water by hand and lifted up onto the rocks. If you attempt to lift a salmon without a net you will lose it for sure. There are no gaps in the rocks to land a fish. 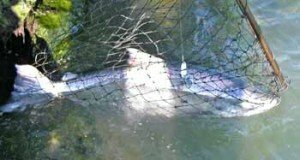 A net is also needed here to safely release any foul hooked salmon. Nets have to be big and strong. This particular net the handle which slides down after pressing a button with your thumb. This makes the net smaller for easier transport to and from the river. 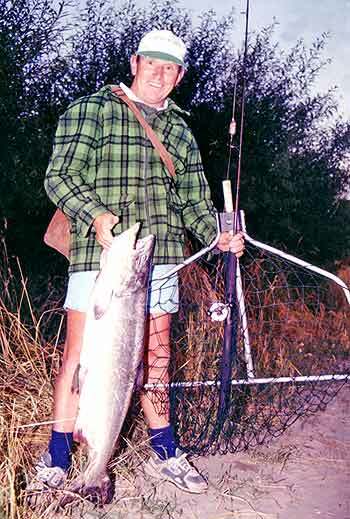 A salmon landing net needs to be made from heavy gauge alloy tube or it will bend when you try to lift a heavy salmon from the water. A quality net like this one is a good investment that will last you a lifetime. 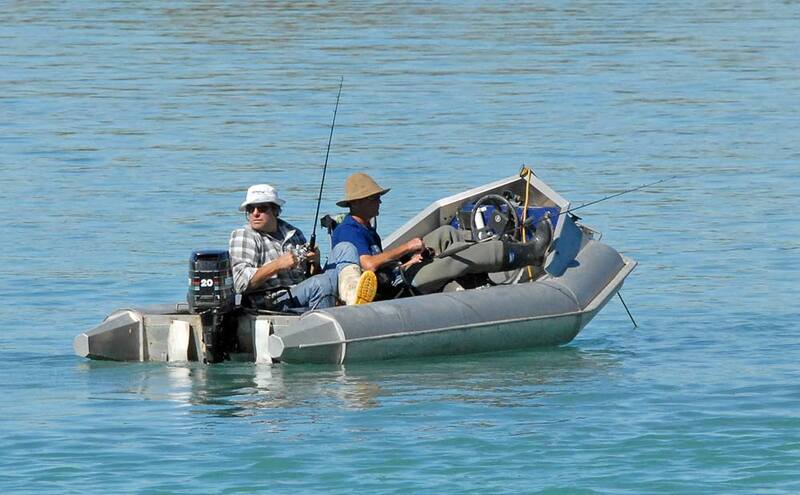 It can also be used when boat fishing for salmon. 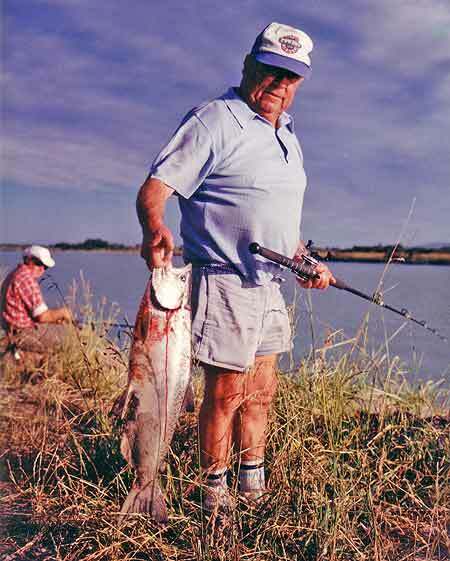 The handle extends to enable you, or a mate, to reach down from the rocks to lift your salmon from the water. So far this season salmon fishing in the lower Waimakariri River has been slow with around 4 salmon per day being caught at McIntosh’s Rocks. Only a few fish have been taken at the river mouth as most early season angler effort has been concentrated at McIntosh’s Rocks due to the river mouth being very wide even at low tide. 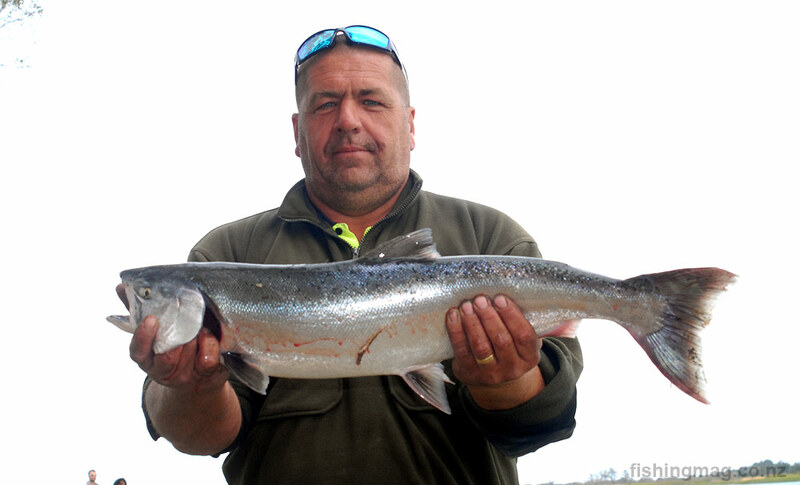 As you can see from the photographs below the salmon have also been small and thin. Weights have been almost all under 10lb with the odd fish caught weighing a few pounds more and in better condition. 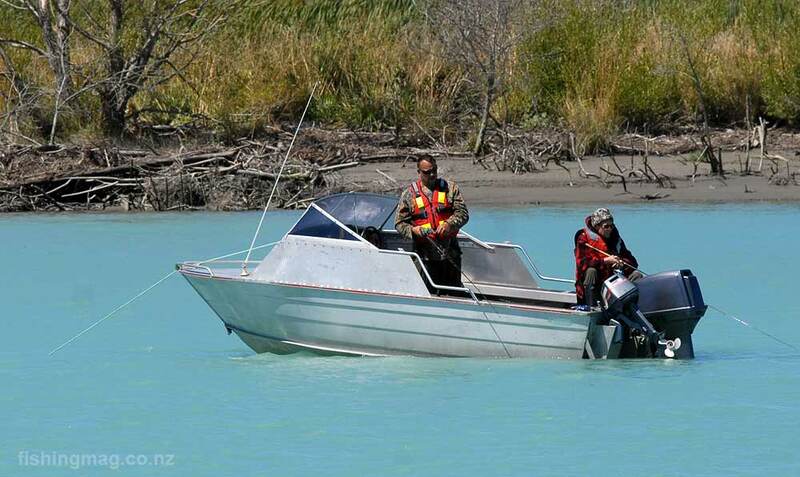 Over the last month, there have been limited opportunities for salmon angling in the Waimakariri River and catch rates so far this season are a reflection of that. Almost constant nor-westers and rain in the alps have certainly put a damper on things. One of the recent floods in the Waimakariri River was so powerful it managed to rearrange some of the enormous rock boulders at McIintosh’s Rocks. 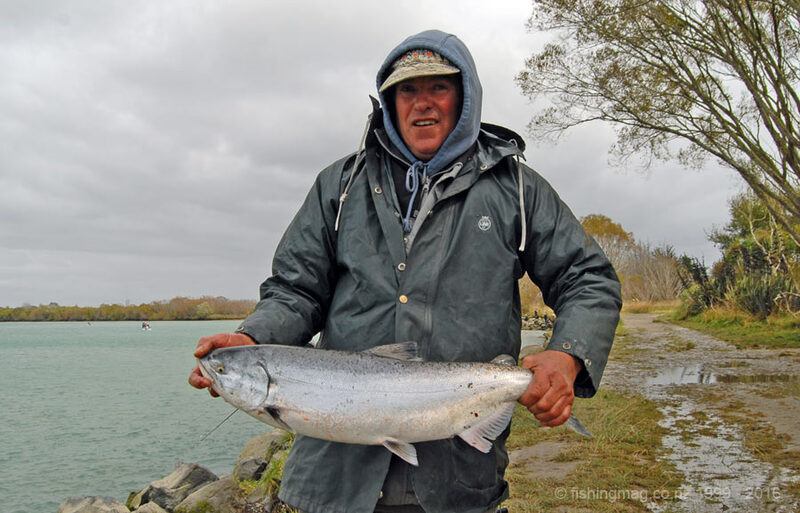 The Waimakariri River generally fishes best for salmon during the month of March so hopefully, the best fishing is yet to come. With the dirty rivers we have had so far it is important to make the most of any respite to get in as much salmon fishing as possible when the rivers clear. It was interesting to see that black Zed spinners can be effective when the river is still a bit milky and are well worth considering before changing over to silver or white and green as river clarity improves. Salmon tend to snap at any lure that comes close to their noses so lures that stand out in the murk are a good bet. 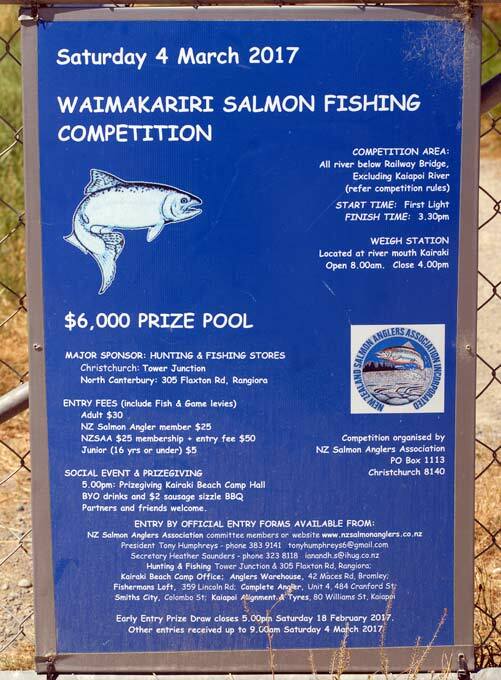 The New Zealand Salmon Anglers Association have again teamed up with Tower Junction and Rangiora Hunting & Fishing stores to bring you the annual Waimakariri Salmon Fishing Competition on 4 March 2017. This event is well run with heaps of great prizes and always attracts a large number of salmon anglers for a great day on the river. 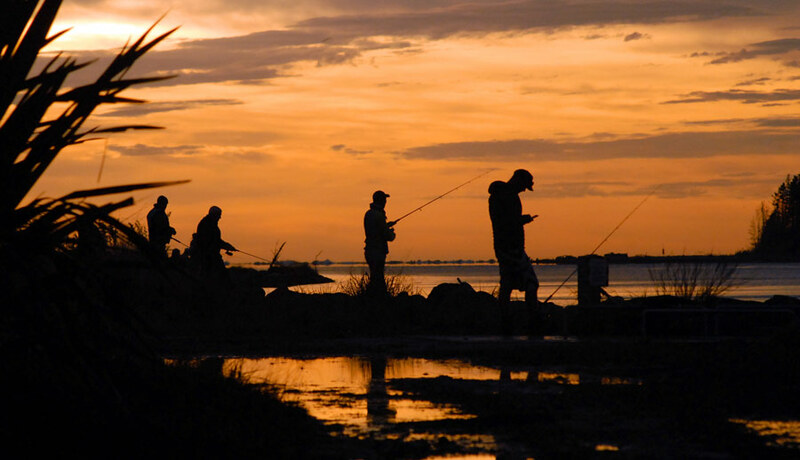 Fishing starts as first light with many arriving in the dark to pick the best spots. So be sure to set your alarm and go to bed early the night before! 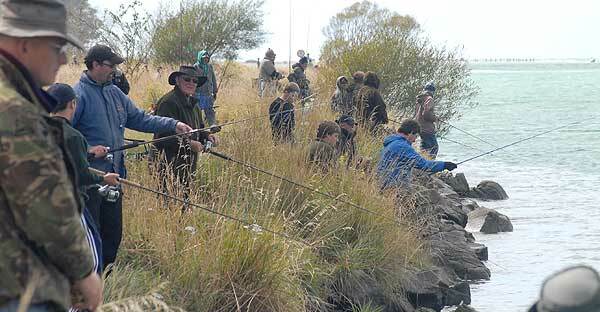 Photographs of anglers at McIntosh’s, Waimakariri River Salmon Fishing Feb 2017. 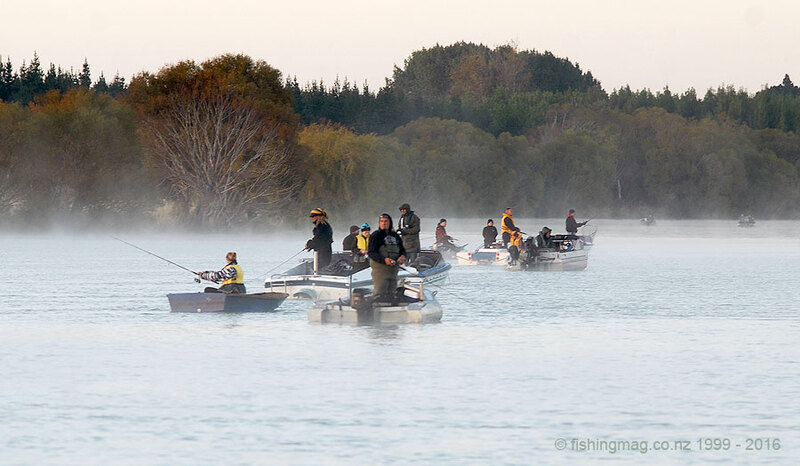 Photographs of anglers at McIntosh’s, Waimakariri River Salmon Fishing 2015-2016 season. Note from the editor Allan Burgess. 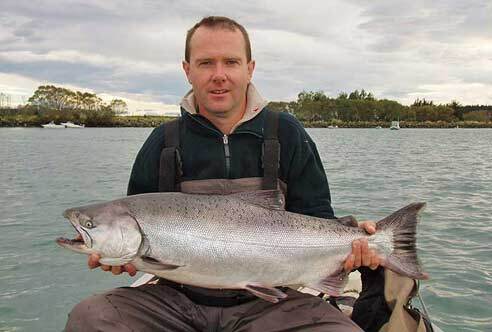 Have you caught a salmon at McIntoshs Rocks? 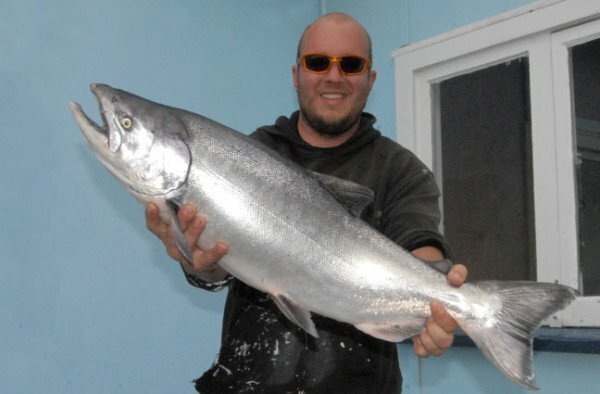 If you have we would love to add your salmon picture to this page. 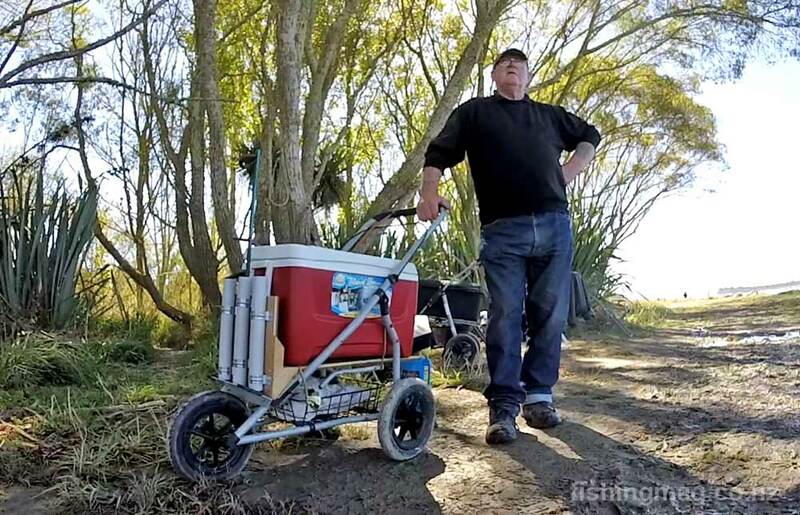 Simply email it to allan @ fishingmag.co.nz (without any spaces) together with a short caption. McIntosh’s Rocks is a good place to target yellow-eyed mullet on small artificial flies. 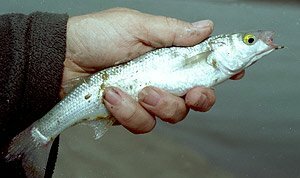 McIntosh’s is a great place for yellow-eyed mullet fishing. These small schooling fish move back and forth with the rise and fall of the tide. They are good to eat and make excellent surfcasting bait for targeting bigger fish. Target them on spinning gear using a D-lead and small fly rig tied on a size 8 hook. 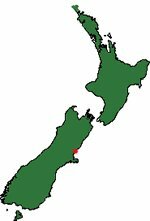 The best bait for mullet are yabbies, which can be extracted from the beach at the Waimakariri River mouth 2 km away, with a yabbie pump. Kairaki Beach Holiday Park, Featherston Avenue, Kairaki Beach. This motor camp is right next to the beach on the north side of the Waimakariri River mouth. 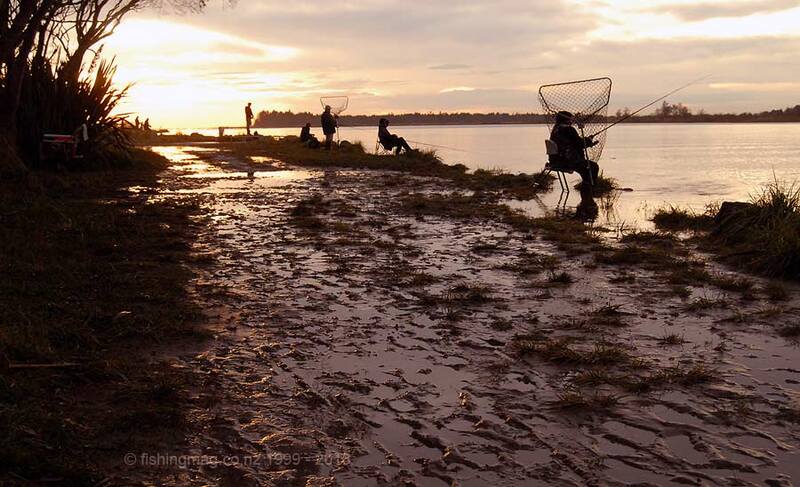 If you are trout or salmon fishing, whitebaiting or surfcasting, this is the place to stay. Run by excellent people. 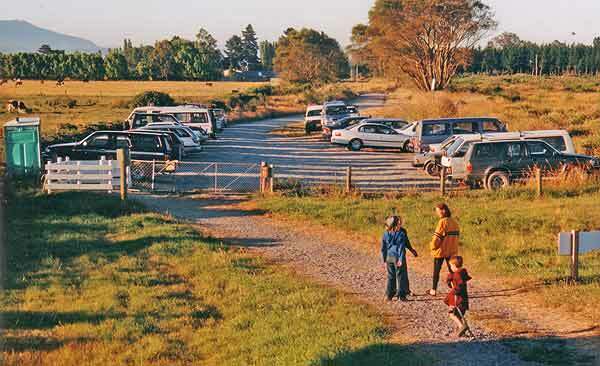 You can park your campervan, caravan, or tent, and walk about 100 metres to the river-mouth. Phone: (03) 327 7335. 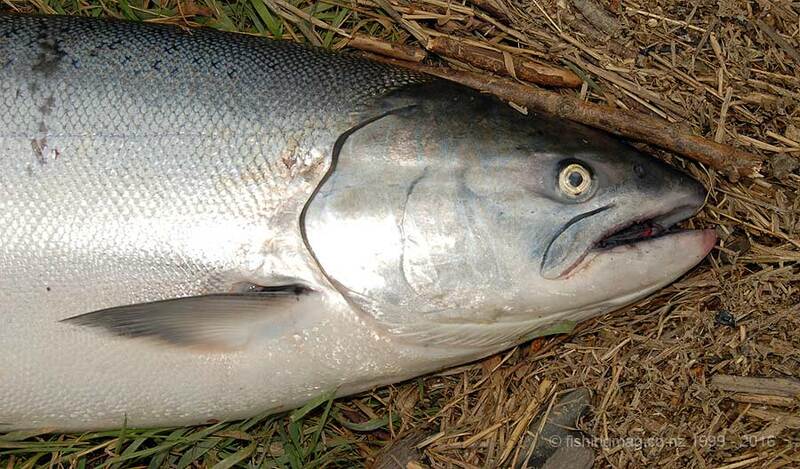 Read 7 Tips for Catching Salmon.